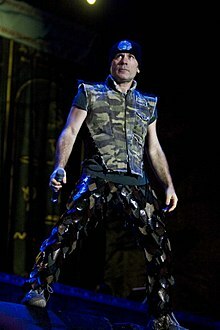 Paul Bruce Dickinson (born 7 August 1958) is an English singer, songwriter, musician, airline pilot, entrepreneur, author, and broadcaster. He is the lead singer of the heavy metal band Iron Maiden and is renowned for his wide-ranging operatic vocal style and energetic stage presence. Born in Worksop, Nottinghamshire, Dickinson began his career in music fronting small pub bands in the 1970s while attending school in Sheffield and university in London. In 1979, he joined the new wave of British heavy metal band Samson, with whom he gained some popularity under the stage name "Bruce Bruce" and performed on two studio records. I'm trying to be as green as I can. As an airline pilot, I have a carbon footprint that's a size 10, so it's pretty hard. I find that fencing and training give me more stamina and help me deal with the craziness of being on the road so much. In my teenage years I was put off the idea of a career in flying, because I'd convinced myself that you had to be a boffin with degrees in maths and physics, which were my weakest subjects. I never intended to become a professional pilot. But, as I became more curious about aircraft, and, well, not being John Travolta, I realized that the only way I was ever going to fly a jet is if I got a job. The celebrity thing, I mean, Lindsay Lohan - what's she for? I look at that and throw my hands up in despair. One of my earliest ventures was when I was nine years old. I realized there was a shortage of pencils at school, so I started Rent-a-Pencil. But I made a fundamental mistake. Everybody stole my pencils. I'm very good at daydreaming. Ask any of my schoolteachers. Everything you need to know about Iron Maiden is onstage. My aim as a frontman is always to try and shrink the venue, if you can, to turn that football stadium into the world's smallest club. At least you have to try. If you really want to annoy me, ask me when I'm going to retire from rock n' roll.